A floating birthday balloon that sticks to the wall. A sponge absorbing water. An exploding soda can. A bottle rocket. 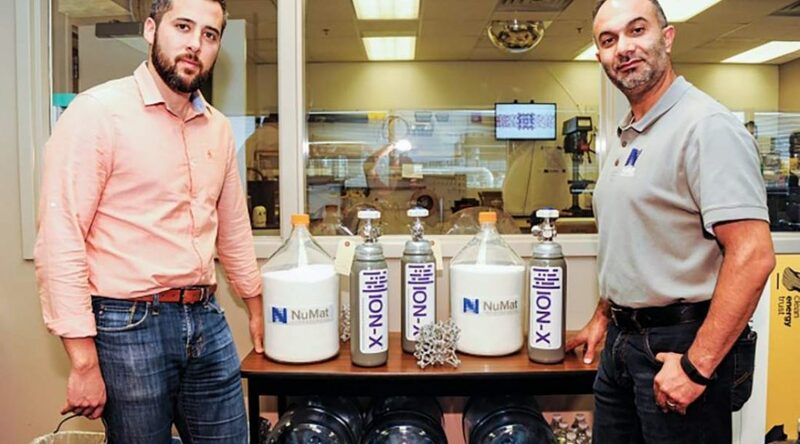 These seemingly unrelated items are all analogies Benjamin Hernandez uses to explain his startup, NuMat Technologies, a nanotechnology company in Skokie that tackles big problems at the smallest possible scale. Think of birthday balloons. When they float around and rub against the wall, they stick to it because the electrical properties of gas determine that it likes to stick to surfaces, the 35-year-old founder said. Hernandez soon found the answer in a class of nanomaterials called MOFs, or metal-organic frameworks. They have high surface areas at the atomic level and porous molecular structures that are great for gas storage and filtering out impurities, he said. Nanotechnology taps the properties of atoms and molecules at a billionth of a meter. Typically, gases are compressed inside big, bulky tanks made of heavy metal, but if the high pressure ruptures the tank, it becomes an exploding soda can that is a hundred times more dangerous. MOFs provide ample surface areas for gases to willingly stick to, which obsoletes the need to highly compress them and improves safety, Hernandez said. This technology also enables more flexibility in tank designs, he said. 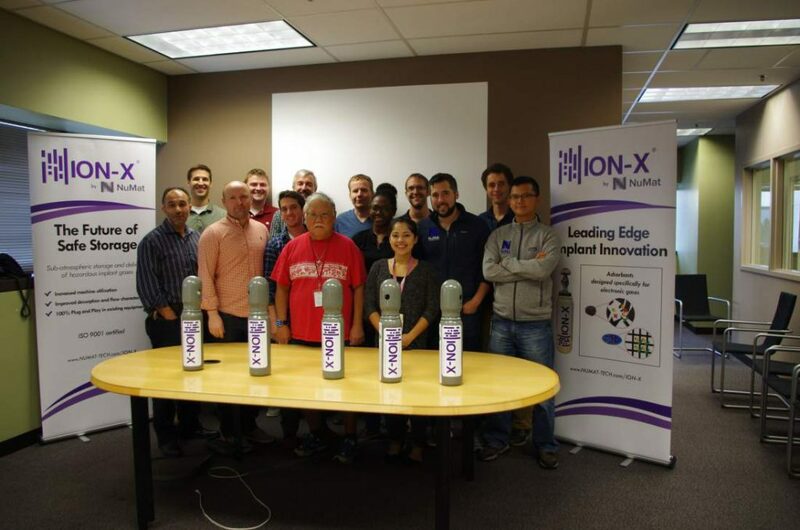 One application is designing plastic, conformable hydrogen or natural gas tanks, in all shapes and sizes, to fit in the trunk of lightweight vehicles. “I think conceptually that’s kind of the wave of the future, using atomic scale machines or engineering to solve complex macro problems,” Hernandez said. When he was a graduate student at Northwestern University, Hernandez began entertaining the idea of starting a business. He wanted to turn a state-of-the-art lab research into an end product that could be applied to real-world issues. Instead of designing a complex engineering system that involves huge plant or capital equipment investments, Hernandez placed his bet on the potential of nanotechnology. He partnered with Northwestern chemistry professor Omar Farha, whose research centers on MOFs. “We had this thesis that basically MOFs as a technology will one day be ubiquitous and we wanted to position the company to be the driving force around commercialization,” Hernandez said. 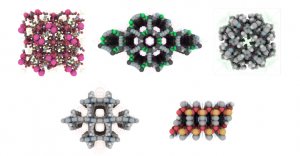 The core capability NuMat developed uses software to screen and predict the performances of different MOFs, and select the right ones for targeted applications in an intelligent way, Hernandez said. Using high-performance computing to accelerate research and development time cycles for chemistry excited this engineering student. The perfect opportunity came knocking in 2012, when Hernandez caught wind of a Chicago business competition called the Clean Energy Challenge, which rewarded the winning startup $100,000 dollars. What used to be the Clean Energy Challenge is now Clean Energy Trust, a Chicago-based not-for-profit that provides venture capital for cleantech startups. Its chief technology officer Ben Gaddy said NuMat was one of their earliest investments. What gave CET confidence that NuMat would be a successful business was their innovation in designing and creating nanomaterials, Gaddy said. He said he believes that NuMat’s core technology will grow into many more markets in the future. Air purification and filtration is another big area that NuMat can apply their technological capabilities to, Gaddy said. He likened the MOFs to atomic sponges that can soak up unwanted gases in the air. Since the initial $100,000, NuMat has successfully raised many rounds of funding and struck up partnerships with companies in different industries. In December, it received a contract from the U.S. Army to develop the next-generation air filtration technology, Hernandez said. “We’re very excited on how we apply our material technology to really critical purification challenges in the semiconductor industry, as well as life sciences, defense and energy sectors,” Hernandez said of NuMat’s 2019 outlook. Although NuMat has grown into a mature business, Hernandez said he will always remember the struggles of building a company from the ground up. As founder of a science-based startup, Hernandez said he had to be very clinical about where to spend every dollar they received from investors, and think long and hard about their application strategy and path to market. Most investors prefer to place their bets on business opportunities with faster returns and lower technical risks, like software companies, Gaddy said, which adds to the difficulty of starting a business backed by fundamental science research. Even so, Hernandez still encourages his NuMat team and people around him to focus on issues that are most essential to the sustainability of the planet. He wants future entrepreneurs to devote their talents to problems that matter the most, not just problems to make quick money on.